Back Story: My husband and I had accumulated quite a spice collection of our own. When we moved into my in-law’s house, my MIL left almost all of her half-used spices. She wanted to buy fresh when she moved. (Clarification: FIL works in another state. H and I are house-sitting/renting my in-law’s house for the next couple of year until my FIL retires. MIL moved in with FIL full time, instead of splitting her time between states and homes.) So we were left with quite a bottles to figure out how to organize. 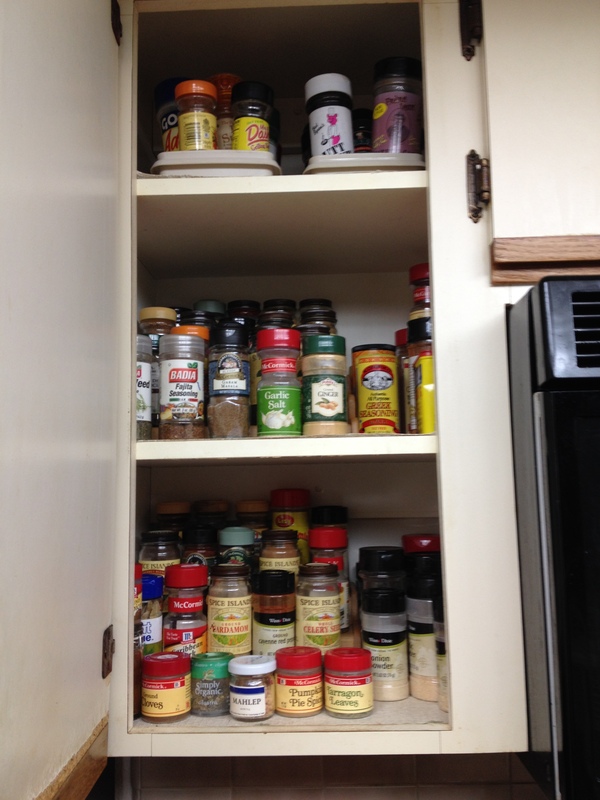 Yes, combined, we have enough spice containers to almost cover a standard size stove top. 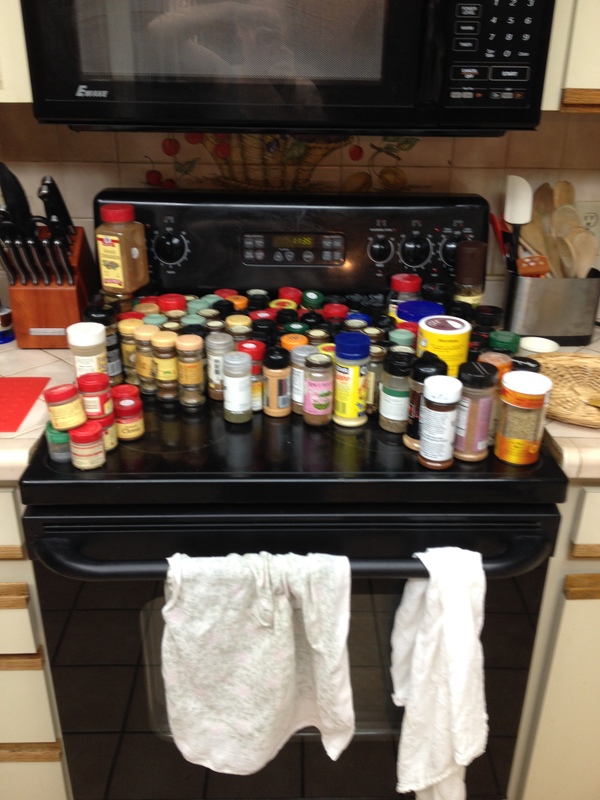 I proceeded to organize them by collecting all the same spices and lining them up alphabetically on the counter. (I forgot to take a picture of this.) I combined as many duplicates as I could. When I still had multiples, I numbered them. The numbers helps me to remember that I have another one as backup for when I run out. I ended up with 3 jars of allspice! And that was after combining them. Seriously, in what universe would I use that much allspice? I had multiples of other spices, but the allspice really stood out to me because of how little I use it. I went to Walmart and about two of the bamboo risers for cabinets. All the little containers stayed on the bottom shelf, front and center, or else they’d get lost. I tucked the risers up against the left side of the cabinet, leaving the right side open for oversized containers and spices I used daily (like garlic powder, onion powder, minced onion, cinnamon, curry powder—Indian and Jamaican, basil, oregano, parsley, and Old Bay. All of the pure spices (not the mixes or rubs, those are elsewhere) were then alphabetized and lined up on the risers. That took up the bottom and middle shelves. The top shelf has two buckets that have all the rubs and commercial spice mixes. We don’t use these too much, because we prefer to make our own concoctions. Peter Walsh hands out simple go-at-your-own-pace to clean out your house. Going room by room, he gives guidelines to help to figure out how you want to room to function and ideas on how to get there. This book contained a lot of good tips and ideas. I’ve already implemented his closet clear out idea. This books reads quite quickly. Recommended.